The corporate headquarters (CHQ) is an important part of the organization of large firms; yet, it is neglected in organization design theory. In this brief essay, I argue that we need a better understanding of the CHQ to further our understanding of the link between the top-management team and the rest of the organization, and to improve our understanding of the costs and benefits of hierarchical organization in general. I outline a number of organizational economics ideas that may help addressing these challenges. The corporate headquarters (CHQ) is an important part of most multi-business organizations (Menz, Kunisch, and Collis, 2015). By “CHQ” is usually meant staff functions and executive management which is tasked with providing services to the company at large. As such, the CHQ is different from the top-management team (although the CHQ is sometimes seen as including the TMT), and this is the sense in which I use the term here. Headquarters differ dramatically in size. Thus, Collis, Young, and Goold (2007) report sizes in the interval from approximately 10 to approximately 10,000, the median number being 4.3 for every 1000 employees (Collis et al. 2007: 385). While business historians, following the lead of Chandler (1962), have long emphasized the importance of the CHQ, it has not yet fully entered general management and organization theory as a distinct, important phenomenon worthy of focused, sustained analysis (Menz et al. 2015), with two exceptions. The first exception is international management research, specifically research on the multinational corporation. Research on the HQ in multinational corporations has been published in the major generalist journals (e.g., Bouquet and Birkinshaw, 2008), and a special issue on the subject has recently been published in a major journal (Nell, Kappen, and Laamanen, 2017). That international management scholars have taken a particular interest in the CHQ is perhaps not surprising, as MNCs have been particularly prone to experiment with HQ organization, for example, allocating HQ functions across different countries. The second exception is diversification research (e.g., Collis, Young, and Goold, 2007). Indeed, in their review of the HQ literature, Menz, Kunisch, and Collis (2015) partition existing research into “multibusiness firm” and “multinational firm” research streams (and point to small literatures in economic geography and finance that consider the CHQ (see also Kunisch, Menz, and Ambos, 2015). However, the CHQ is a phenomenon of general interest that goes beyond the research concerns of the international management field or diversification research (Ferlie and Pettigrew, 1996; Menz, Kunisch, and Collis, 2015), simply because it is an integral part of most large companies (Mintzberg, 1992). And yet, virtually all organization design theory pays little attention to the CHQ. While it may receive a mention, and sometimes more sustained discussion (e.g., Mintzberg, 1992), the CHQ is mainly seen as a provider of support services, operating under the instructions of the top-management team. It is arguable that the relative neglect of the CHQ is quite a significant gap in organization design theory. This is so for a number of reasons. The CHQ maintains and adapts the organization’s design. It connects the TMT and the rest of the organization. Given this, a solid understanding of the CHQ may be necessary to fully grasp some of the ongoing trends in corporate organization, notably delayering, the expansion of top management teams, and the continuing shrinking of corporate boundaries. Finally, at the perhaps most fundamental level, we need to better understand the CHQ to fully grasp the causes of both hierarchical success and failure (Williamson, 1996; Nahapiet and Ghoshal, 1998), because both are to a large extent dependent on the CHQ. In this brief essay, I suggest that organizational economics—that is, agency theory (Holmström, 1979, Holmstrom 1999; Tirole, 1986; Ross, 2014), transaction cost economics (TCE) (Coase, 1937; Williamson, 1985, 1996), information-processing team theory (Marschak and Radner, 1972), and property rights economics (Grossman and Hart, 1986)—offer very useful insights and tools for raising and answering key questions about the CHQ, including the very fundamental ones. These questions include the truly fundamental ones, such as why do CHQ exists? What are its functions and organization? What explains its size? These are, of course, variations over Coase’s (1937) fundamental questions about firms. Answering them will allow us to better understand the role of the CHQ in the “organizational advantage” (Nahapiet and Ghoshal, 1998), that is, what are sources of the distinctive advantage organizations have (in certain respects) over other institutional arrangements. Among the multiple functions undertaken by the corporate headquarters are handling corporate information and communication technology, taxes, law, external communication, marketing, finance, and human resources (Collis, Young, and Goold, 2007; Kunisch, Müller-Stewens, and Campbell, 2014). These are obvious support functions, and it is perhaps natural to think of the CHQ as a passive instrument in the hands of the TMT if the sole focus is on such functions. However, the CHQ does much more. Thus, it engages in strategy implementation, control, the management of vertical and horizontal information flows, running transfer pricing systems, the maintenance of reward systems, and other tasks dedicated to maintaining coordination and cooperation across the hierarchy are handled by the CHQ. In other words, the CHQ does much more than supply corporate services and support the TMT; to a large extent, the CHQ is the execution branch of the TMT. It not only maintains and hones the overall organization design, but also, jointly with the TMT, takes action when internal misfit emerges, or when new strategic initiatives call for complementary changes in the organization design. Thus, the CHQ maintains organizational design within the confines laid down by the TMT and the board of directors (Menz and Barnbeck, 2017). Mintzberg (1992) famously portrayed an organization as consisting of an operating core, a technostructure, a support staff, a middle line, and a strategic apex. The TMT and the CHQ constitute the latter, and the CHQ may also reach into the technostructure and the support staff. However, the relations between these basic components of organizations are imperfectly understood. Specifically, we now have a rich, successful, and expanding research domain, now in its fourth decade of existence, that addresses the TMT (Hambrick and Mason, 1984; Hambrick, 2007). And we have an organization theory literature, also reaching back several decades, that addresses hierarchical organization in general, including phenomena like divisionalization, departmentalization, allocation of decision rights, lines and modes of communication, and control. But, as argued by Hambrick (2007), these two bodies of research are imperfectly connected. Part of the reason for this is that none of them offers much attention to what connects the TMT and the rest of the organization in real firms, namely, the CHQ. This is a problem to the extent that the CHQ is really performing an important linking function. Virtually all major companies have relatively sizable CHQ (Collis et al. 2007; Menz et al. 2015). To be sure, there are a few examples of major organizations that have very small CHQs (e.g., Berkshire-Hathaway), but these are exceptions. Indeed, having too small headquarters may spell trouble. A highly pertinent example is the current crisis of the Catholic Church, its biggest crisis since the Reformation. Much of the crisis arguably has to do with a lack of real accountability combined with too small headquarters. While the Church is indeed in many ways a highly concentrated power structure, the size of the Curia, the church’s CHQ, is relatively small, which may imply relatively weak supervision capabilities and a lack of capabilities of synthesizing information from the rest of the organization. In general, the issue of what is the right size of the CHQ and what are the capabilities it needs to possess are important design questions for any major organization. However, optimal CHQ and capabilities are likely to change over time. In fact, research suggests that we are witnessing an ongoing global tendency to corporate delayering with implications for our understanding of the role and functioning of the CHQ. Our best analyses of the delayering phenomenon have been carried out using US data (see Wulf, 2012, for a summary, as well as Rajan and Wulf, 2006, and Guadalupe, Li, and Wulf, 2014). This line of research finds that while many firms have indeed delayered, this does not necessarily mean that decision rights have been delegated downstream in the hierarchy. In other words, delayering does not necessarily mean “empowerment.” On the contrary, Wulf and her collaborators found evidence that delayering has been accompanied by an expansion of the size of top-management teams and argue that delayering has taken place because top-managers want to exert more, rather than less, control over daily operations. However, such control would seem to be feasible only if the top-management team has access to complementary services from a well-functioning corporate headquarters. In spite of its obvious importance, the CHQ remains neglected in organizational design theory. For example, virtually all of the influential fields of organizational economics (e.g., Holmström, 1979; Williamson, 1996; Grossman and Hart, 1986), or what we may call economic organization design theory, does not deal with the CHQ. Thus, there is a little explicit discussion of the CHQ in the key contributions to transaction cost economics (Williamson, 1985), principal-agent theory (Holmström, 1979), and property rights theory (Grossman and Hart, 1986). For example, while the CHQ is mentioned in Williamson (1975, 1985), it does not receive any sustained analysis. The reason arguably is that in much of organizational economics, there is an implicit assumption that dyadic employer-employee (TCE), principal-agent relations “scale up,” and that for the purposes of conceptualizing what firms are and do this is sufficient. The two-person, employer-employee firm is qualitatively the “same thing” as the 100,000 employees, diversified corporation with huge CHQ. Thus, analyzing the nature and function of the CHQ simply adds institutional detail to the basic analysis of managerial authority. Admittedly, this is a bit of caricature, but, like many caricatures, it is not far from the truth. For example, Milgrom and Roberts (1992), perhaps the most successful organizational economics textbook so far, and ostensibly written for the MBA-market, does not feature a discussion of the CHQ. However, there are hints that point towards an organizational economics approach to the CHQ here and there in the literature, and the neglect of the CHQ in the body of thought does not mean that it is irrelevant to understanding the CHQ; quite the contrary. For example, Jensen and Meckling (1992) suggest that the CHQ defines the organizational rules of the game that provide (1) a system for partitioning decision rights out to agents in the organization, (2) a performance measurement and evaluation system, and (3) a reward and punishment system. Holmstrom (1999) describes the firm as a “subeconomy,” and likens the CHQ to governments in national economies. However, in spite of receiving a mention here and there, the CHQ itself remains a black-box in the organizational economics literature. This is not to say that this body of theory does not potentially have much to say about the CHQ. In fact, the opposite is the case. In the following, I list a number of CHQ-related issues that may be illuminated by an organizational economics approach. From an organizational economics perspective, the perhaps overarching question concerns what explains hierarchical success as well as failure. By “success” is meant that certain properties of hierarchical organization makes it more economically attractive to shift transactions from the market to the hierarchy (or undertake transactions internally that have been subject to market transaction, e.g., in innovation). Williamson (1996) in particular stresses that administrative instruments are available to hierarchical organization that is not available in the market, but unfortunately does not offer much elaboration. In fact, the “organizational advantage” (Nahapiet and Ghoshal, 1998)—that is, the advantages of organizations vis-à-vis markets and other institutional arrangements—remains ill-understood in organizational economics. There are some candidate explanations of what the advantage may amount to, such as the possible benefits (e.g., knowledge sharing and other helping behaviors; lower incidence of opportunism) of the lower-powered incentives that are characteristic of hierarchical organization (e.g., Gibbons, 2005), or the scale economies from centralizing the design and running of reward systems (Holmstrom 1999). Another line of reasoning stresses that hierarchical organization may have particular advantages in the context of coordinating complementary activities and investments (Milgrom and Roberts, 1992: Chapter. 4; Williamson, 1996). However, these are very partial stories, for which only limited evidence exist. Relatedly, the understanding of “hierarchical failure” (or the “organizational disadvantage”), that is, the forces that make it more attractive to organize a transaction in the market, is generally agreed to be incomplete (Grossman and Hart, 1986; Nickerson and Zenger, 2008). The broader problem is this: an imperfect understanding of the costs and benefits of hierarchical organization also means that our understanding of the general issue of the organization of transactions across alternative governance structures is incomplete. Therefore, advancing our understanding of the role and functioning of the CHQ means advancing our understanding of the potential and limits of hierarchical organization, which in turn means a better understanding of then forces that shape the organization of transactions across hierarchies and other institutional arrangements. Thus, understanding the CHQ contributes to understanding the forces that shape the boundaries of firms, one of the key issues addressed in the economics of the firm (Coase, 1937). In the following, I briefly discuss some more specific ideas from this body of thought that are helpful for CHQ research. The purpose is not to develop full-blown ideas, but to suggest avenues for future CHQ research. Organizational economics highlights that delegation arises in response to handling the opportunity costs of managers (top managers have high opportunity costs of time), asymmetric information (those to whom a task is delegated may have superior knowledge), and speedy adaptation (delegation may mean that decisions do not need to be passed up and down a hierarchy). However, the well-known dark side of delegation is the agency problem (Holmström, 1979). The literature (including the management research literature) assumes that the CHQ exercises benevolent, enlightened despotism, akin to the way in which economists traditionally have thought of governments, deciding on, and implementing, the delegation of decision rights that equalize the (agency) costs and benefits of delegation on the margin (Jensen and Meckling, 1992). In other words, the CHQ is conceptualized as a unified decision-making body, perfectly implementing the decisions of the TMT, and always acting in the best interest of the company. However, just as “government failure” is now widely recognized in economics, so scholars may wish to adopt a view of the CHQ as an entity composed by individuals who are self-interested, sometimes ill-informed, and often boundedly rational. This has a number of implications. First, information may get distorted (because of bounded rationality) so that the CHQ does not implement exactly what top management decided. Second, even if there is no information distortion, there may still be moral hazard in the interaction between top managers and members of the CHQ (as well as within the CHQ itself), so that top manager decisions get inefficiently implemented. A pertinent recent modeling exercise is Ross (2014). He builds an agency model of the division of managerial labor which starts from a basic distinction between entrepreneurial management task and execution-oriented management task. These may be thought of as hierarchically distributed (cf. Tirole, 1986), so that members of the TMT mainly handle the more entrepreneurial management tasks (strategic planning, the acquisition, and divestment of major resources, etc. ), while the CHQ handles the more implementation and execution-oriented tasks. Of course, tasks may be changed between the TMT and the CHQ, depending on benefits and costs stemming from task specialization and complementarities. The key point in Ross’ analysis is that he models moral hazard (or “opportunism”) which he primarily links to the entrepreneurial managerial services (as these are more likely to be characterized by asymmetric information), but there are surely also CHQ services for which asymmetric information conditions are relevant. Acting as the “corporate brain” (Foss, 1997), the CHQ services the top-management team (and the Board of Directors) by synthesizing information that flows from the rest of the network of corporate units (Marschak and Radner, 1972). How well does it perform this function? This partly depends on the degree of informational overlap between the CHQ and the units. The need for informational overlap, in turn, depends on the specific organizational design of the relevant firm. In principle, with profit center organization, the CHQ may require relatively little knowledge about the actual operations of units. Of course, usually much more information flows to CHQ than mere accounting statements containing profit/loss figures. Such information need to be understood, digested, assimilated, and synthesized—which requires the right knowledge and skill set in the CHQ. Research here may look into how the staffing of the CHQ in terms of individuals with different educational backgrounds, education, etc., influence the processing of information and the outcomes of such processing (i.e., the “screening ability” of the CHQ, Sah and Stieglitz, 1985). Empirically, such work may start from demographic variables and measures that have been established in the TMT literature as having a bearing on decision-making (Hambrick, 2007), and examine how, for example, diversity influences the processing, synthesizing, and passing on of information. Research suggests that members of the CHQ have network ties that differ qualitatively from the ties of members of other corporate units. Perhaps not surprisingly, they tend to have more ties, and their ties are more likely to be characterized by structural holes (Kleinbaum and Stuart, 2014). These tie characteristics are not only useful for the purposes of overall corporate coordination, but also for supporting resource orchestration processes following top-management initiative. The potential dark side is that employees with these network characteristics are also employees who control information streams, which can be a political challenge, and who possess strong bargaining chips. Concerning the latter, research may address if having many ties that are, furthermore, characterized by structural holes implies particularly high salaries which can be taken as proxies for bargaining strength. Organizational economics research suggests that an important benefit of hierarchical organization is that it makes it costly for subordinates to influence hierarchical superiors that are above one’s immediate superior (Milgrom and Roberts, 1992). While it may seem desirable to pass on all relevant information to hierarchical superiors, in actuality influence (i.e., lobbying) activities can be problematic because it may make managers make decisions in favor of subordinates (i.e., rent-seeking) rather than because these decisions are the objectively right ones, and because of the sheer costs created when employees scramble for favors rather than spending their time on productive activities. Increasing the distances between would-be influences and those they seek to influence is a way to reduce the risk of biased decision-making as well as the costs of engaging in influence activity. Research here may not only look at the role of the CHQ in gatekeeping and protecting top-managers against influence activities, but also the extent to which the CHQ itself may be subject to rent-seeking influence activities. For example, research finds a tendency to allocate disproportionately many funds to big, poorly functioning divisions (Rajan, Servaes, and Zingales, 2000), which may reflect rent-seeking efforts vis-à-vis the CHQ and top managers. The interaction between CHQ and units takes place over time, giving rise to expectations, the formation of trust, and the breaking of trust, retaliation, etc. Asmussen, Foss, and Nell (2019) model a dynamic (psychological) game (Rabin, 1993) between a CHQ and subunits, making precise assumptions about justice expectations, environmental turbulence, project attractiveness, and goal conflict. They argue that CHQ intervention may often seem warranted, for example, to block local initiative that does not fit the overall strategic logic of the firm. However, such intervention can unintentionally destroy value. This has an ex post as well as an ex ante aspect. Ex post units may form negative perceptions of the intervention which may have negative motivational consequences and a negative impact on effort allocation. Ex ante the intervention, units may expect to be overruled by CHQ and refrain from taking initiatives that would benefit the company. Asmussen et al. (2019) show how under such conditions, successful parenting may, paradoxically, entail forgoing opportunities for increasing value creation by intervention. The existence of important and meaningful CHQ tasks and their continued existence in major companies suggest that the CHQ add value and are important parts of modern firms. As such, the relative neglect of the CHQ in most organization design theory is a major gap. The CHQ has two overall tasks (Chandler, 1977; Foss, 1997). First, it is the unit that is primarily responsible for running the “sub-economy” that is the firm (Holmstrom, 1999) in terms of maintaining, repairing, introducing, etc., management information systems, reward systems, etc. Second, it also has a more entrepreneurial role to play, namely, as the corporate entity that in conjunction with top management orchestrates major change initiatives, whether these aim at responding to major external or internal misfits, or whether they are directed towards innovation. Both functions help explain corporate parenting advantages, that is, why a particular business may best be organized by firm A (with its CHQ) rather than firm B (with its CHQ). The specific approach taken in this short essay is to call for more research on the CHQ from the perspective of economic organization design theory, that is, organizational economics. Such an approach can address the fundamental questions concerning the CHQ, such as why it exists. Basically, economies of scale and learning in the above two tasks suggest that they be centralized in one unit (Holmstrom, 1999). Because the activities and (human) assets of the CHQ become co-specialized with the rest of the firm as the CHQ carries out its activities, and therefore may be subject to potential hold-up, CHQ services are produced internally rather than being procured from the outside (Williamson, 1985). The extent to which CHQ activities are separable from/complementary to other firm activities helps determining the internal boundaries of the CHQ vis-à-vis other corporate units. An organizational economics inspired approach to the CHQ may also help illuminate its internal organization by focusing on task interdependencies and asymmetric information inside the unit itself (Ross, 2014). 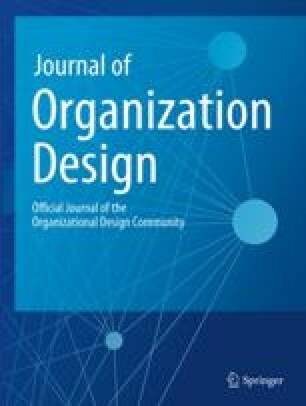 In sum, the core message here is that the key ideas of the economics approach to organization design are clearly applicable to the rationale, size, boundaries, internal organization, etc., of the CHQ and its role as a unit in a larger organization. Understanding how the existence, internal boundaries, and organization of the CHQ depend on “fundamentals” such as the skills of members of the CHQ, scale economies in information processing tasks, asymmetric information, task and skill complementarities, etc., also help us better understand the contingencies that shape the CHQ. For example, digitization fundamentally impacts on a number of these fundamentals and thereby shape the CHQ.